Guild (If any): Bounty Hunter's Guild. He is buff, and has pale skin, green hair (very messy), red eyes, and three scars on both cheeks. He wears no shirt, as it blocks the spikes on his arms, same reason for no shoes. The only clothes he is seen wearing is a headband, and white trousers, healed by a brown belt. He can deactivate a seal on his back to attain his true form. This gives him dark red wings, scales, spikes, and claws. The whites of his eyes also turn dark red, his pupils become animal like, and the color of the eye (black blue green, you know) disappears. Amnesia: He has amnesia of his past BEFORE his experiment, and he is annoyed by it. Caring: the dude is very caring. This ALSO means he doesn't pull any punches, pointing out flaws in things they do or something they need to fix. Loyal: When it comes down to it, he will pick his loyalty to his friends over anything, even his own health. He is the guy who would beat the crap out of someone who bullies his friends, and if he loves you, *whistle* he's probably gonna come back with some blood on him. Happiness: He is happy almost all of the time, smiling a warm and true smile, and hardly ever frowning. Friendly: He is VERY friendly. Shortened Fuse: When in use of ANY of his powers, he becomes less patient and easily irritated. Likes: friends, family, GOOD mages. Dislikes: seeing anyone one he cares about get hurt, BAD mages, people with no morals, wanted me, being sent after men who have been framed, sending him after men who have been framed and KNOWING they were framed, bounty hunters who follow the path of a Juggernaut. I remember waking up in a testing chamber, I had spikes, and WINGS! I looked in the mirror to see I had three scars on my cheek, and my hair was green, I had also noticed my eyes looked weird. Suddenly I was released and greeted by a weird looking man, who I would find out later to be a mage who specialized in making chimeras and enchantments. He explained that I was his 1st chimera to not end up beast like, and was part dragon, part demon. He then went on to tell me of my abilities and that he had a gift for me, little did I know this was just a bribe to get me to go along with him. He handed me a handle of sorta, and told me to speak the name. When I spoke it, two beams of light shot out of the end, forming a weird sword, as I swung it, it felt rather easy, as if I had been trained to use it. He puts me through several experiments, and eventually let me out into the real world, to see how then would react. At 1st they hated me, but then the man put a spell on me to make me look human, sadly sealing my powers too. As I walked I noticed others had families, and I didn't. Everyday my jealousy grew and grew, until I finally remembered something. It was only a few seconds, but I saw the man, killing my parents, and kidnapping me. In a rage I flew back to him, and slaughtered him with the sword: Ragudo Mezegis. He must have not expected his own two creations to destroy him, judging by his shocked expression that was frozen on his dead face. I left, and became more knowledgeable, see SEVERAL corrupt mages, and then I decided to become a bounty hunter. My normal targets are rouge mages who are criminals, but I'm not above the normal dirty work. All Seeing Eye: He basically can tell if you are lying. 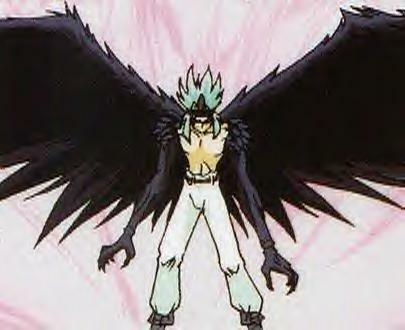 Flight: using his dragon/demon wings he can fly. Scale armour: everywhere but his chest and head area is covered in dark red spikes and scales, absorbing have the damage of spells (demon half) and working a steel armour against melee attacks. Blade's Master: He is proficient with all forms of swords, but is best with a double bladed sword. Bounty Hunter Training: He focuses on the use of his body, making him a major athlete, running as fast as 20 mhp and cracking rock with on punch. He also has a great stamina, fighting for LONG periods of time. Do to not being used to the speed and strength of being a dragon and demon, he is tired after using them. He is often feared by others, most people trying to kill him on site. No hybrids. Im sorry if I didnt make it clear. No part dragon part whatever part human part cheese, I dont care. Just no hybrids.